Summary (from the inside flap of the book): Me: My name is Greg Gaines. I am seventeen. I am the one who wrote this book. My physical appearance is unsatisfactory, and there is probably a fungus eating my brain. I'm not even sure I'm a human. Earl: Earl Jackson is the only person is even sort of my friend. We make mediocre films together. Werner Herzog is our biggest influence. Earl is generally filled with violent rage. Dying Girl: During my senior year, my mom forced me to become friends with a girl who had cancer. This brought about the destruction of my entire life. 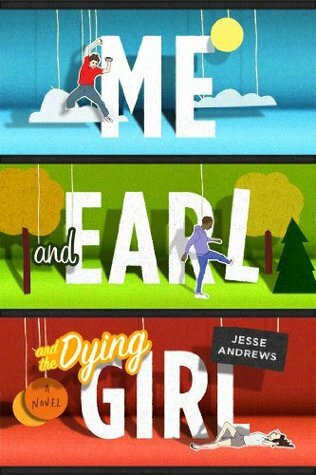 Review: So this is a book about a high school senior who is diagnosed with leukemia. I expected something completely different from the book that I just completed. I was ready for sad, depressing, and thoughtful (I think I was expecting something like John Green's The Fault in our Stars). Not! 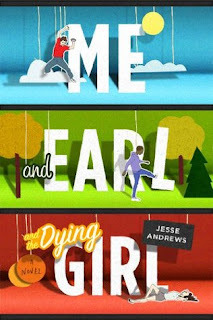 This book isn't really about Rachel, the "dying girl", but about Greg (the narrator), a quirky, self-aware, sarcastic seventee-year-old who is trying to figure out where he fits in. Greg talks to the reader throughout the book, commenting that he cannot believe we are still reading his book, don't we have better things to do with our time, etc. He is self-deprecating, funny, and lonely. I love how he has high school all figured out: how to avoid being in any one social group, but belonging to every clique at the same time. Like a bee or butterfly going from flower to flower, he manages to know everyone yet commit to none. He and his best friend, Earl, make movies. They aren't good movies, but boy do they have fun making them! Earl and Greg have a really interesting friendship. Earl has a tougher life, doesn't have real goals for himself, yet he is wise beyond his years. Rachel and Greg have known each other for years, but haven't really been friends. What do you say to a teen who is dying when you don't really know her? How do you pass the hours you spend together? This is Greg's dilemma. The nice thing is he finds out stuff about himself and others during the time he spends with Rachel. This book is funny and poignant and a great read.